The world's largest lithium ion battery has begun dispensing power into an electricity grid in South Australia. The 100-megawatt battery, built by Tesla, was officially activated on Friday. It had in fact provided some power since Thursday due to demand caused by local hot weather. South Australia has been crippled by electricity problems in recent times. Tesla boss Elon Musk famously vowed to build the battery within 100 days - a promise that was fulfilled. "This is history in the making," South Australian Premier Jay Weatherill said on Friday. The battery would prevent a repeat of a notorious incident last year where the entire state lost power, Mr Weatherill said. Mr Musk has described it as three times more powerful than the world's next biggest battery. Can Tesla live up to its value? The idea began when Mr Musk was asked on Twitter if he was serious about helping to resolve South Australia's electricity woes. Mr Musk said he was - adding that if the battery wasn't built within 100 days, the state would receive it for free. The countdown began on 30 September after a plan was approved by the state government and regulators. Tesla finished the battery in about 60 days. Located near Jamestown, about 200km (125 miles) north of Adelaide, the battery is connected to a wind farm run by French energy company Neoen. When fully charged, the battery can power up to 30,000 homes for an hour. However, it will mostly be used to support and stabilise existing electricity supplies. The battery consists of a grid system that runs on the same technology that powers Tesla's cars. In a statement, the company said the completion of the battery "shows that a sustainable, effective energy solution is possible". The battery in South Australia is just one of several similar projects with which Tesla is involved. Smaller banks of batteries, also intended to smooth out power supplies, are also installed in Southern California, Hawaii, New Zealand, in the UK and on several Pacific islands. Luxury hotels in South Africa, on islands and in remote locations are also using small power storage systems. The company has also talked about sending more battery packs to Puerto Rico which lost almost all its power generating systems after Hurricane Maria swept across the region. Retailer Target and online giant Amazon have also expressed interest in storing power. Amazon said it was piloting a program to use the batteries at data centres. The power source would keep servers running if electricity is cut and help keep supplies stable. Tesla said the expertise it built up building lithium-ion batteries for its cars helped it develop the bigger power packs for the energy storage systems. 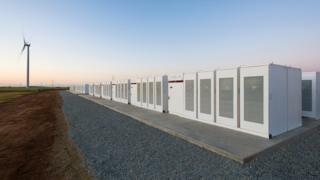 The batteries used in energy storage facilities that connect to the grid are not exactly the same as those seen in Tesla cars but have some design elements in common. Tesla has partnered with Panasonic on the development and production of its Powerpack technology. Despite this, it partnered with Samsung on the Southern Australia facility because Panasonic could not produce the required batteries within the tight deadline. Tesla will soon be facing stiff competition from power firms. Next year, a battery storage facility 50% larger than Tesla's in Australia will be turned on in South Korea. Chinese firms and many other renewable energy firms are also installing many battery storage systems for power suppliers around the world. Will Alpine villages really pay you to move there?